Our teams at Ruskins are highly qualified and experienced. 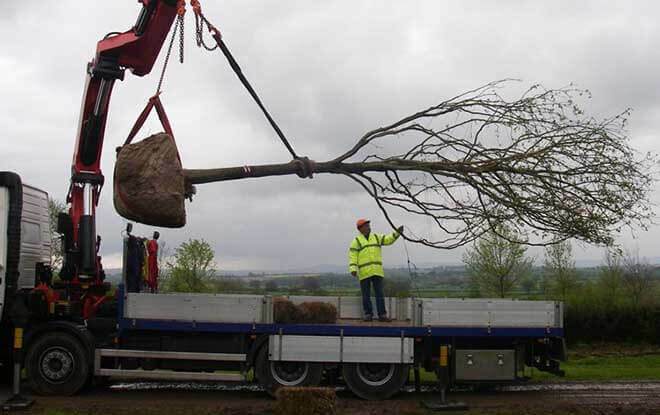 We have been moving, supplying and planting trees since 1986. A warm welcome to Ruskins Trees & Landscapes Ltd. We have been supplying, planting and moving large trees, shrubs and hedges since 1986. Our aim is to provide a service that is second to none – we strive not merely to meet expectations but always to exceed them. You are invited to browse our website and in so doing we hope you might gain a useful insight into our nature and capabilities. We appreciate that your time is valuable and extend to you the same respect and good wishes that would have epitomised a more personal meeting between us. We are CHAS, SSiP and Safe Contractor accredited, which are national threshold standards, primarily for Health & Safety which compliment our other benchmarks, that we have recently been re-accredited with : ISO14001:2004 (Environmental Management) and OHSAS 18001:2007 (Health and Safety Management), ISO9001:2008 (Quality Management) and have British Association of Landscape Industries (BALI) approved contractor status. Our reputation for exemplary service is both our hallmark and your guarantee of satisfaction. We look forward to speaking with you soon. If you are looking to import trees prior to Brexit we can help. We can either store them or unload at your location and ensure they are stored and cared for to facilitate later use. We do not want to fan the flames of uncertainty over Brexit, just provide a solution to one of it’s concerns.